Important notice: The Whiff of Joy release party for the new Party Animal collection will be held on Friday, Jan. 2nd, 11pm GMT+1 (5pm EST) at the WoJ group on Papercraft Planet. Wichtige Information: Die Whiff of Joy release party für die neue Party Tiere Kollektion wird am 2. Jänner um 23:00 in der WoJ group auf Papercraft Planet statt finden. Ich hoffe euch dort zu sehen!! This month's theme for the Whiff of Joy Papercraft of the month was to wrap chocolate creatively. In Switzerland there exists chocolate with any kind of flavour...haha and I found this delicious one, filled with essence of champagne. Perfect for this new Whiff of Joy stamp designed by Alison Acton, which will be released at 0:00 tomorrow night. Ich habe eine besonders leckere mit einer Füllung aus Champagnermark gefunden, perfekt um die Tafel mit dem neuen Stempelmotiv von Alison, das morgen unter anderen um 24:00 erhältlich sein wird, zu dekorieren. The base of my chocolate wrap is "close to cocoa" cardstock from Stampin' Up which I embossed with the cuttlebug embossing folder "spots and dots". 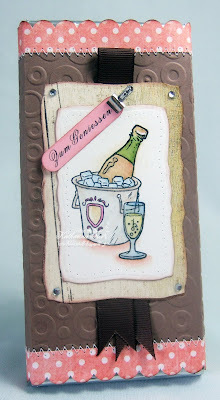 I used the new Stampin' Up scalloped border punch on the design paper from Bo Bunny (which I got from Paperbasics). Die Basis meiner Schokoladenverpackung ist "Close to Cocoa" cardstock von Stampin' Up, den ich mit der Embossing Schablone "spots and dots" von Cuttlebug embosst habe. 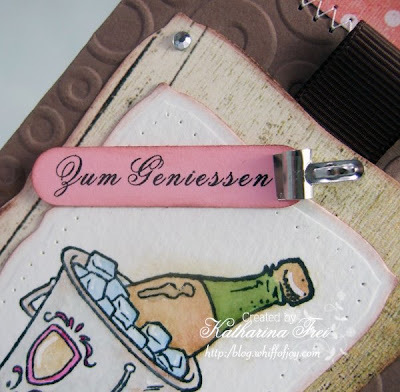 Mit dem neuen "Scalloped border punch" von Stampin' up habe ich dann das Motivpapier von Bo Bunny (habe ich von Paperbasics) ausgestanzt. 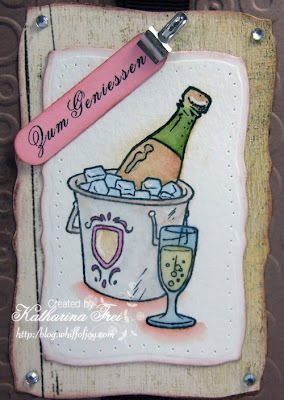 I used Spellbinder's curved rectangles to cut and mat the WoJ champagne cooler. I used some crystal effects on the bottle and the glas. The sentiment is generated on the computer and means "Enjoy". Ich habe Spellbinder's curved rectangles verwendet um den Sektkühler auszustanzen und zu matten. Auf der Flasche und dem Glas habe ich crystal effects verwendet. Den Text habe ich am Computer erstellt. Brilliant and another fantastic stamp. Can't wait to see them all together. Absolutely fabulous Katharina!! Happy New Year! I'm really looking forward to the release of the new stamps. I love the way you wrapped the chocolate bar, it makes it look even MORE delicious. LOL. And another great stamp, love it! Can't wait till the release party, I'll be there! I'm so excited to finally get to see ALL of the new cute stamps. Oooo...Champagne filled chocolate!! Yum!! Very creative wrap. too cute! love it! great idea, too! Can't wait till tomorrow! Looks just yummy! Can't wait for the release! Katharina this is fabulous! I love the image - it's so versatile and will be brilliant for all sorts of different cards.